In 300 BC, the Syrian city of Antioch had public street lighting fuelled by olive oil. At the 1900 Paris World Fair, German inventor Rudolph Diesel demonstrated his engine powered by peanut oil. Biofuels are not new, but many of the technologies are; and interest in renewable, sustainable biofuels has recently been rising due to worry about peak oil and price pressures, vulnerability of energy supplies, dependence on imports and greenhouse emissions. Bioethanol produced mainly from sugarcane replaced 40 per cent of gasoline used in Brazil in 2008, with the introduction of flex-fuel vehicles allowing high-blending of bioethanol with petrol (all petrol blends in Brazil contain 25 per cent bioethanol). The first generation of biofuels was produced from starches, sugars and oils of agricultural crops, including corn, sugarcane, rapeseed and soybean. It must be noted, however, that Brazil’s biofuel industry has been plagued with problems such as air pollution due to burning, deforestation, soil degradation and competition with food crops such as soybean. Indonesia has sparked controversy, also, with orangutan habitats being cleared for palm oil production. In Australia, biodiesel is being produced from used cooking oil (an agricultural by-product), tallow and canola seed; and bioethanol is produced from sugarcane molasses, grain sorghum and waste wheat starch, but availability of feedstock is the main limitation to widespread use. Due to its abundant reserves of uranium, coal and natural gas, Australia is nominally self-sufficient in energy except for transport fuels and heavy oils. Currently, bioethanol and biodiesel are being imported as renewable replacements for petrol and diesel, respectively. Australian annual bioethanol production capacity is 440 ML, and biodiesel production is 500 ML, although not all production facilities are operating at full capacity due to a shortage of feedstock. In times of global concern about food security, there is a serious ethical debate about using food crops and arable land for biofuel production. In the USA, almost one-third of the corn crop is grown for bioethanol production. Brian Fleay of the Australian Association for the Study of Peak Oil and Gas (ASPO Australia) calculated that if the entire sugarcane and wheat crop in Australia is converted to ethanol, it would only supply 20 per cent of Australian transport fuels. This means that by burning our food for fuel, we would have no bread or sugar and very little fuel. Due to food and energy security concerns, many countries – including Australia – are promoting biofuel crops that can be grown on land not suited for food production, so that the two systems are complementary rather than competitive. The recent L.E.K. Consulting Advanced Biofuels study proposed several alternative biofuel feedstocks that do not compete with food production. 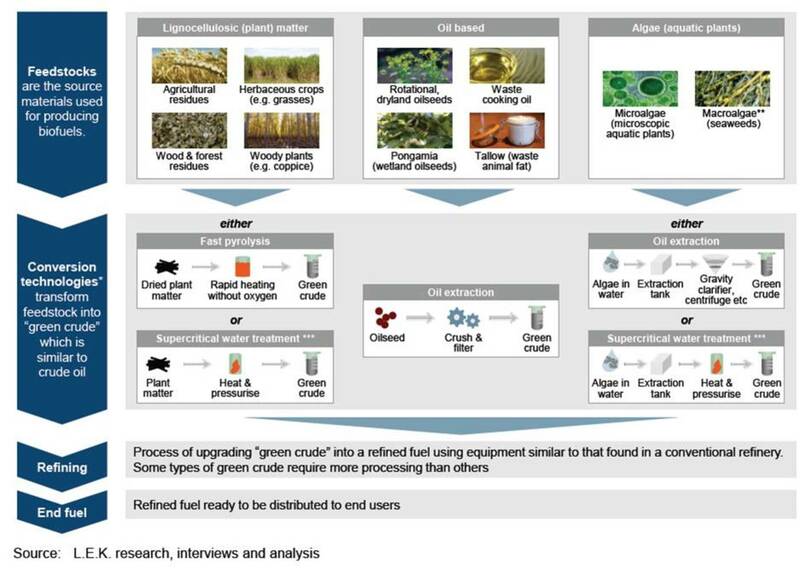 Microalgae are being developed as a biodiesel feedstock, but there are still challenges such as the high capital and production costs of scaling up from laboratory to commercial production. Pongamia (Milletia pinnata) and Indian mustard (Brassica juncea) are oilseeds and have been suggested as feedstocks for biodiesel. Pongamia is a tropical tree legume native to India and Australia; plantations have been established at Gatton and Caboolture in southern Queensland, Roma in south-central Queensland and Kununurra in Western Australia. A breeding program for elite varieties from existing superior germplasm is now being undertaken by the ARC Centre of Excellence for Integrative Legume Research at the University of Queensland. Indian mustard is an annual oilseed crop closely related to canola and rapeseed. An Indian mustard breeding program for biodiesel production was established in 2006 at the University of Sydney Plant Breeding Institute at Narrabri by Professor Richard Trethowan. Indian mustard is now part of the four-year rotation there and there are two biodiesel batch processing plants to provide biodiesel self-sufficiency at Narrabri. The breeding program has been successful and 600 new advanced lines based on Pakistani/Australian crosses were tested in 2011. Promising high yielding lines with high oil content are now being tested in multi-locational pre-commercial regional trials. Another potential bioethanol feedstock is agave (Agave spp.). Agave uses a type of photosynthesis called Crassulacean Acid Metabolism (CAM); agave plants open their stomata (microscopic pores) at night and take up carbon dioxide in the dark to form malic acid, which is then metabolised to release carbon dioxide for photosynthesis during the following day. By closing the stomata during the day, less water is lost and water use efficiency may be as much as six times greater than a C3 photosynthesis species, such as wheat. Hence, agave is adapted to semi-arid land not suitable for food production. I conducted a study in collaboration with the University of Oxford, showing that bioethanol derived from agave has a positive energy balance: the bioenergy created is five times the amount required to produce it. In June 2009, Don Chambers and Joseph Holtum of James Cook University planted the first trial of blue agave (Agave tequilana) at Kalamia Estate, near Ayr in north Queensland. The plants are now two years old, and have survived two wet seasons as well as Cyclone Yasi. Growth rates have been higher than agave planted at the same time in Mexico. New and novel feedstock conversion technologies are being developed such as fast pyrolysis and supercritical water treatment that can now convert any biomass feedstock such as wood residues (e.g., Eucalyptus spp. ), agricultural residues (e.g., wheat and corn stalks), woody plants (e.g., poplar and willow coppice) and herbaceous C4 grasses (e.g., switchgrass, Miscanthus and sweet sorghum) into a green biocrude that can be processed into jet fuel, biodiesel, and bioethanol. Professor Thomas Maschmeyer at the University of Sydney is now developing a commercial supercritical water treatment for processing forestry waste and seaweed (macroalgae) into biocrude for companies such as Ignite Energy and Licella. The transport sector uses 60 per cent of global oil production and has relied on fossil-based liquid fuels for more than a century. Large-scale biofuel production has been criticised for replacing food production and consuming arable land. Hence, we should promote sustainable biofuel feedstocks growing on non-arable land to produce future renewable bioenergy in harmony with continued food and fibre production. Daniel Tan is a senior lecturer in agriculture at the University of Sydney.